Huge amount of support from Doggy Dan himself (in the forums). The $37 is monthly, while it presents good value, the cost over a year would add up. One could argue there is actually too much information. Can be overwhelming when you first start. Summary: The Online Dog Trainer is an excellent resource. Being endorsed by the National SPCA really does add to the credibility of the service and goes a long way to make it one of the best dog training leadership programs available online in the world today. With over 250 videos, a packed forum with Doggy Dan himself answering questions and giving advice, and the great podcast and downloadable audio guides, you do get an awesome amount of information for the money. 3 Who is Doggy Dan? 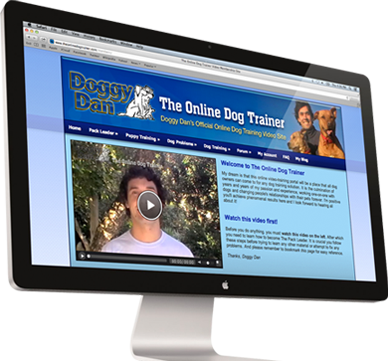 Doggy Dan is the man behind The Online Dog Trainer service. The content that he has created on the website is the result of a long career as a dog trainer and behaviorist. He first started the website in 2009, so the amount of content available within the guide is actually quite amazing. There are now over 250 training videos available, the forum contains a huge amount of detailed information and quite simply covers everything you could ever need. 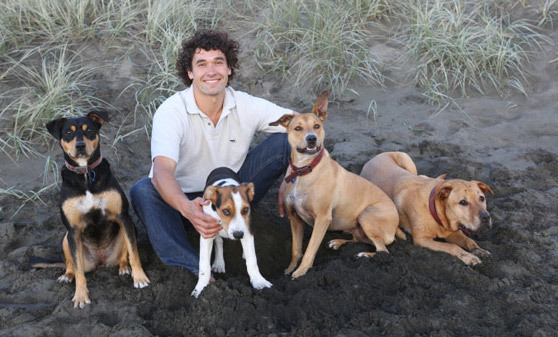 Furthermore, Doggy Dan is actually endorsed by the national SPCA (Society for the Prevention of Cruelty to Animals) of New Zealand. The only online dog-training guide in the world afforded such valuable endorsement. The guide pitches itself to both new dog owners and those that may have had their dog for a while and are experiencing some behavioral issues, or simply those that would like to understand their beloved dog that little bit better. What’s great about the site is the sheer amount of information available. And while this could make it overwhelming when you first log on, the way it is all laid out within the site, (and the fact that so much is provided in the way of instructional videos) you can quickly find any area of guidance that you need. For those that need reassuring, the dog training approach taken does not involve harsh methods of punishment or any prior experience, so literally anyone with an internet connection can use this resource. 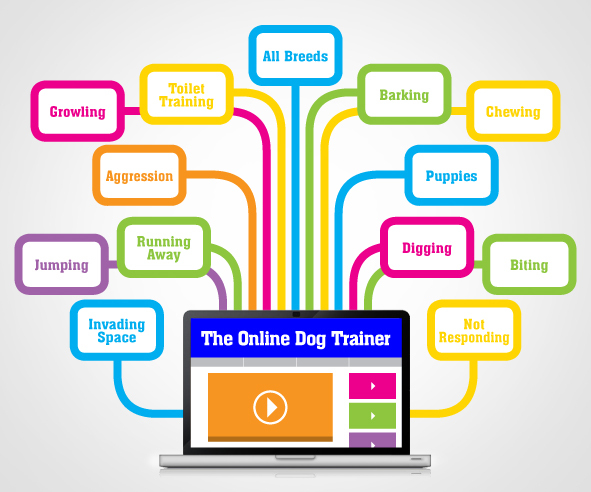 With this amount of content, The Online Dog Trainer is way ahead of the competition in the way of content. Quantity has not been prioritized over quality either. Each video really does give in depth information on the topic being addressed. Doggy Dan is also very good in front of the camera, serious when he needs to be, but also genuinely charismatic. This makes the videos entertaining to watch as well as informative. His energy and clear love of the dogs comes across in all the videos which really makes a difference. 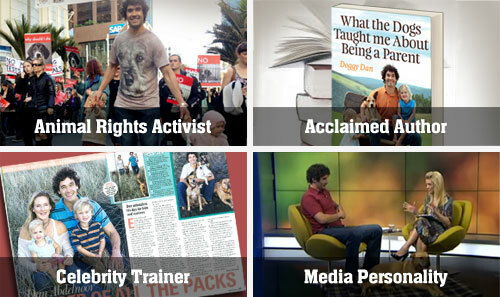 A great feature are the videos of Doggy Dan’s real client consultations. The dog’s being trained clearly do have extensive behavioral issues. Within this footage you see the techniques explained in the training videos, used in real life training situations. Furthermore, the videos are not edited excessively so that you can actually see the consultation unfolding and how the results were achieved. This includes all the body language of both the dog and the trainer. Video is clearly the best medium for a dog training guide and far better than anything you could ever gain from a book. Watching an experienced dog trainer explaining why a dog is so stressed and then watching the dog change is something that can only be expressed properly via real footage. 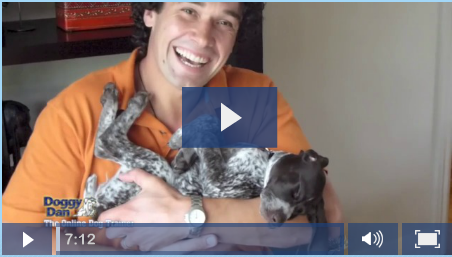 In this series of videos you are provided with everything you need to know when training a puppy. This includes a timeline of your puppy’s development, and what needs to be taught, in what way and when. This really was a god send to me in particular as I had recently been given a puppy English Terrior called Bobby around the time I signed up to the course. The best part of this section is that Doggy Dan has actually filmed the training of his very own dog called Moses. You can view every step of the process as the trainer takes on a SPCA Border Collie crossed with a Labrador at the age of just 8 weeks old. Everything is recorded here so you can see exactly how a new puppy can be trained, and the results of the techniques described. An excellent resource and one of the best reasons to subscribe to the site. 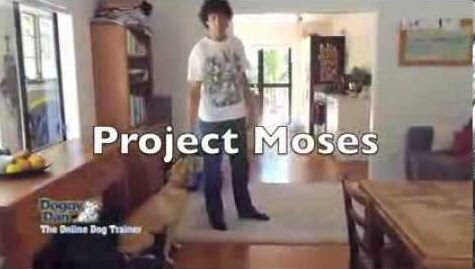 Project Moses – A full series showing how Doggy Dan trained his own dog from 8 weeks old. Acknowledge the difference between biting and mouthing. Foods for dog and how to feed your dog exactly. This section of the site is relevant to all dog owners at some point. It will help you understand why your dog may be behaving abnormally, and the steps you can take to overcome the problem. The website forum is a great additional source of information with Doggy Dan answering questions and leaving feedback on a consistent basis. There is a real sense of community here, with a lot of subscribers leaving comments and asking for specific advice. It is clear from the answers left in the forum that Dan tries to ensure owners are given the best information and advice every time. Audio files are accessed throughout the site and can be listened to as additional commentary beside the video footage. It is also very easy to download the files and listen to them on your phone when you are on the commute to work, or wherever suits you. There is also a podcast show that Dan regularly records updates for. The methods used by Doggy Dan are all completely in line with my own way of thinking, gentle and kind rather than with punishment. He is not a great believer in treats either. It is more about understanding your dogs needs and why they behave in a certain way. With the emphasis on becoming the pack leader, you do not need aggressive or fear tactics to see great results in your dogs training. I have been amazed in the development of our Bobby in the time that I have been using these training videos. The 1 dollar trial is a fantastic way to see exactly what I have been talking about in this review. Just click on the link below and you will be taken to the Online Dog Trainer website where you can gain complete access to everything that is available to a subscriber. This really is the ultimate try before you buy. This is an exceptional offer and really gives you the opportunity to see just how valuable the website is. A very generous offer indeed and something that very few other sites will give you. Once you’ve decided to stay on after the 1 dollar 3 day trial, you pay $37 per month to continue your access. This is when the site really comes into its own. As a subscriber you can slowly go through the various training videos that are relevant to you and your dog’s needs. Re watch and study and use what you have learned on your own dog, and enjoy the results. $37 a month is worth every cent and I am very happy to have access to the site as and when I need. I can’t imagine not having this resource now in fact. With Doggy Dan you end up understanding your dog so much more, and this in turn helps solve virtually any dog behavioral problems you might come across. You literally have nothing to lose by signing up to The Online Dog Trainer. Doggy Dan offers a 60 day money back guarantee, meaning that you can cancel and get a full refund in that time. Believe me, you won’t feel the need to do so. The Online Dog Trainer really is an incredible resource. Being endorsed by the National SPCA really does add to the credibility of the service and goes a long way to make it one of the best dog training leadership programs available online in the world today. With over 250 videos, a packed forum with Doggy Dan himself answering questions and giving advice, and the great podcast and downloadable audio guides, you do get an awesome amount of information for the money. That’s why there is a 60 day money back guarantee – even after 2 months you will only cover the tip of the ice berg of what’s available on this website. Additionally, there is the fantastic Project Moses meaning you can observe the real training of Doggy Dan’s own dog from 8 weeks old. The ultimate puppy training resource basically. Then there is the section on becoming the pack leader, a no fear or aggression method used, and every behavioral issue covered; you basically have a a one-stop, complete dog training solution available when ever you need on your computer, tablet or mobile. Watching a trainer whom the dogs clearly bond with and whom they respect is testimony to Doggy Dan’s gentle and effective approach. I do believe every dog owner can benefit greatly by viewing what is on offer here. Hence this in depth review. I really cannot recommend The Online Dog Trainer enough. It is a wonderful resource that should be checked out by all.